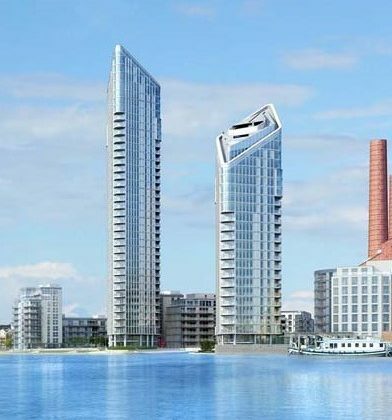 Following the successful complete of Canaletto, we were engaged by Ardmore Construction to design and detail the complex halo steelwork and balconies at Chelsea Waterfront. 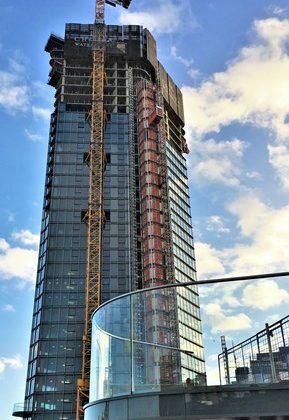 The halo steelwork forms the sub-frame for the distinctive diamond shape at the top of the 37 storey block of luxury apartments overlooking the River Thames next to Lots Road Power Station. The steel frame is divided into approximately 20 modules with complex geometry and challenging connection forces requiring technical expertise, creativity, diligence and persistence to resolve. The framework also supports the perimeter stair, feature lighting, rainwater gullies, cladding, mechanical and electrical equipment. Much collaboration was required within a tight knight team lead by Ardmore to complete the design.